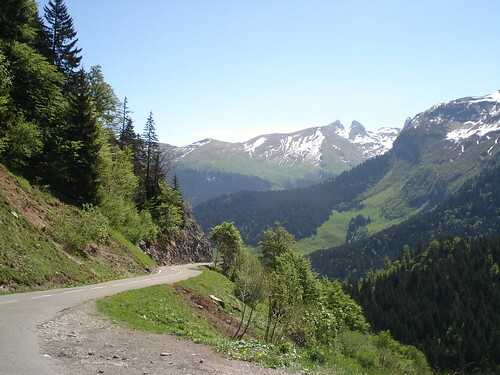 Col de la Colombiere is the closest “famous” climb to me – just over 30 minute drive away. It was in the Tour last year and I will be cycling it again with a couple of friends on July 17th, in this year’s Tour de France. Strangely, at the bottom it was signed as CLOSED – although I was pretty sure there would be no snow remaining. In the event, it meant less traffic on a beautiful Sunday – and there was just a little snow at the side of the road. The last 3kms are very steep – my wife still curses the finish from a couple of years ago. A VERY strong head wind made today’s finish particularly daunting – this is the second time I have passed cyclists walking the last stretch here. Just “rode” this pass last week (May 8, 2008) and had to walk through the snow and mud (skipping switchbacks) for the last 1500 meters. It’s still closed! Well done! Sounds like an adventure. Yes, things are just starting to open up and it takes more than just having the snow melt – they need to “clean” the road as well.